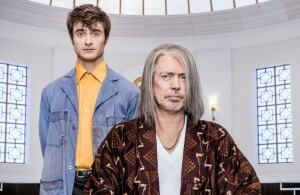 “Miracle Workers” (TBS, 10:30 p.m.), the new comedy from Simon Rich (“Men Seeking Woman”) has Steve Buscemi as God, feeling ambivalent about his creation; Daniel Radcliffe as a low level angel. “It’s sort of like a cross between the Old Testament and ‘Goonies,’” Rich said Monday at the TV Critics Association winter press tour. Also new tonight is an updated new adaptation of a fondly-remembered 1992 romantic comedy with Eddie Murphy, Robin Givens and Halle Berry. Berry said the updating allows them to “deal with all the issues that our millennials are facing today, which are very different” than those in the 1992 original. The premiere comes after an episode of the new “American Soul” (BET, 9 p.m.), in which Bobby Brown plays Rufus Thomas. The sports documentary “The Many Lives of Nick Buoniconti” (HBO, 10 p.m.) looks at the ex-Miami Dolphin player who became a lawyer, sports agent and TV host, only to become an advocate for those with spinal and brain injuries after his son suffered a college football injury that left him quadriplegic. “The Real Housewives of Beverly Hills” (Bravo, 9 p.m.) returns for a new season, with the addition of Denise Richards. “American Chopper” (Discovery, 10 p.m) returns for its 12th season. Mrs. Adler is embarrassed that she joined a children’s music group on “Teachers” (TV Land, 10 p.m.). A 9-year-old is found in a storage unit on “NCIS” (CBS, 8 p.m.). It’s Valentine’s Day on “The Kids are Alright” (ABC, 8:30 p.m.), “Blackish” (ABC, 9 p.m.), “The Rookie” (ABC, 10 p.m.) and “Splitting Up Together” (ABC, 9:30 p.m.). There’s a love theme, too, on “Drunk History” (Comedy Central, 10 p.m.). “Lethal Weapon” (Fox, 8 p.m.) has a border patrol episode. Kevin tries to help Nicky on “This is Us” (NBC, 9 p.m.). Accounting goes after an expensive dinner bill on “Corporate” (Comedy Center, 10:30 p.m.). Katie plans a “friend date” on “American Housewife” (ABC, 8 p.m.). “FBI” (CBS, 9 p.m.) goes after armed robbers. Mysterious green fireballs nearly cause a nuclear disaster on “Project Blue Book” (History, 10 p.m.). Jane’s new therapy uncovers childhood memories on “Many Sides of Jane” (A&E, 10 p.m.). There’s a premature Town Hall (CNN, 10 p.m.) with Starbucks head turned presidential candidate Howard Schultz. Gael tries to get legal help on “Good Trouble” (Freeform, 8 p.m.). On “New Amsterdam” (NBC, 10 p.m.), Bloom faces her personal demons. Couples consider their directions on “Temptation Island” (USA, 10 p.m.). Whitney has no fun climbing a rock wall on “My Big Fat Fabulous Life” (TLC, 8 p.m.). “Expedition Unknown” (Travel, 9 p.m.) turns into a competition show. Blackouts make Isobel loopy on “Roswell, New Mexico” (CW, 9 p.m.). Brandon asks Madisson to appear in his music video on “Siesta Key” (MTV, 9 p.m.). There’s another “My Great Big Live Wedding with David Tutera” (Lifetime, 10 p.m.), this time with Luis and Kristin. “NCIS: Orleans” (CBS, 10 p.m.) looks into the disappearance of a Navy entomologist. Turner Classic Movies has a couple of Oscar movies featuring prominent butlers, “The Remains of the Day” (8 p.m.) and “Merrily We Live” (10:30 p.m.), followed by a couple of movie debuts that resulted in best supporting actress wins, “On the Waterfront” (12:15 a.m.) and “East of Eden” (2:15 a.m.). Earlier, it’s all about fighting Nazis with “Ship of Fools” (5:45 a.m.), “The Desert Song” (8:15 a.m.), “The Stranger” (10 a.m.), “Watch on the Rhine” (noon), “To Be or Not to Be” (2 p.m.), “Night Train to Munich” (4 p.m.) and “Casablanca” (6 p.m.). NBA action has Boston at Philadelphia (TNT, 8 p.m.) and Utah at Golden State (TNT, 10:30 p.m.). Hockey has Chicago at Boston (NBC Sports, 7 p.m.). Men’s college basketball includes St. Bonaventure at Saint Joseph’s (CBS Sports, 6:30 p.m.), LSU at Kentucky (ESPN, 7 p.m.), Michigan State at Wisconsin (ESPN2, 7 p.m.), Pittsburgh at Boston College (ESPNU, 7 p.m.), Butler at St. John’s (CBS Sports, 8:30 p.m.), Duke at Louisville (ESPN, 9 p.m.), Kansas State at Texas (ESPN2, 9 p.m.), Arkansas at Missouri (ESPNU, 9 p.m.) and San Diego State at Colorado State (ESPN2, 11 p.m.). Women’s hockey has U.S. at Canada (NHL, 7 p.m.). Team events are played in skiing’s Alpine world championships (NBC Sports, 10 a.m.). Kelly Ripa and Ryan Seacrest: Craig Ferguson, Natasha Lyonne. The View: Lorena Bobbit. The Talk: Adam Devine. Ellen DeGeneres: Rebel Wilson, H.E.R. Wendy Williams: Jenny McCarthy, Sherri Shepherd. The Real: Erika Jayne, Daneliya Tuleshova. Stephen Colbert: Regina King, Bill Gates, Melinda Gates, Jena Friedman. Jimmy Kimmel: Ray Romano, Charles Barkley. Jimmy Fallon: Will Forte, Gigi Hadid, Blake Mycoskie, Gashi with G-Eazy. Seth Meyers: Don Cheadle, Jake Johnson, Kurt Vile. James Corden: Liam Hemsworth, Rebel Wilson, Priyanka Chopra. Carson Daly: Carmen Ejogo, Mt. Joy, Rhenzy Feliz. Trevor Noah: Spike Lee. Conan O’Brien: Daniel Radcliffe. This entry was posted in What's On TV, Winter Press Tour 2019. Bookmark the permalink. Both comments and trackbacks are currently closed.